In late 2015, a health system based in Chicago, Illinois, announced that it was integrating two new organizations. This expanded the system’s presence to multiple hospitals and nearly 100 locations. These 2015 integrations were initiated as part of the health system’s broader acquisition and growth strategy, and the deployment of an Enterprise Resource Planning (ERP) system was a core component of each new integration. Previous integrations had highlighted substantial challenges faced by existing hospital staff in HR, IT, Finance and Supply Chain functions in adopting a new ERP system while maintaining effective patient care. What is more, both of the new organizations needed to be integrated by early 2017, a short timeframe. Leadership recognized the need to create a repeatable method for addressing the people side of these integrations. “The research foundation of Prosci provided credibility for change management at our organization. It made it easier to get our senior team and project members on board. The methodology is simple and flexible, and the research so accessible that we can make the most informed decisions for our organization." To apply change management on two ERP system integrations as a demonstration of enterprise change capability and leadership competency. Based on overwhelming research conclusions that effective change sponsorship is the most critical success factor of a change initiative, the first activity that the change management team took on was creating a sponsor coalition and implementing a series of biweekly sponsor meetings. These meetings featured informal education on the role of a change management sponsor, ensuring that every sponsor understood their role and how to fill it effectively. Building this knowledge was critical to the project, as it kept the sponsors engaged and bought-in to the change management work. It also provided space for sponsors to receive updates, clear up any confusion and remove any roadblocks that came up as the project continued. The team also launched a robust ERP coaching program, pairing the health system lead in HR, Finance and Supply Chain with the staff members fulfilling the same function at the two new organizations. The program’s onboarding plan allowed these individuals to meet in person and build relationships with each other and the lead, and its training plan empowered the staff to learn the system with enough time, structure and information to succeed at go-live. Learn how the change management team utilized ADKAR assessments to gauge progress and diagnose gaps, and discover more of the results they have seen, when you download the full story as a PDF. 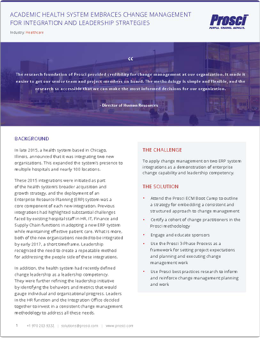 In late 2015, leadership at a health system based in Chicago, Illinois, decided to apply change management on two ERP system integrations as a demonstration of enterprise change capability and leadership competency.